Annoyances and a Heart Check. Today has been one of those days that started out well, initially, but then took a quick and flawless dive off into the deep end. In all of the…ugh in my day, a little thought emerged. That is when my attitude changed. Let me fill you in. This morning, in an unprecedented picture to our usual hurry-get-out-of-the-house-while-throwing-something-in-your-mouth-for-breakfast-while-putting-on-the-right-shoes, we actually all enjoyed a little breakfast, we had time to play a little and then, with a smile on my face, we had plenty of time to get where we needed to go as we headed out the door to the car. We were not only going to be on time somewhere, but we were leaving early enough for me to stop at the store and grab a few goodies for the sweet ladies who attend Wednesday morning Bible study with me. Today was our last day to meet. We were gathering one last time to focus and soak up the words Jesus spoke on a mount – His sermon. As the facilitator of this study, I really wanted to make this a special day and have a little “thank you for coming” breakfast for everyone. So, imagine with me if you will, the moment I went from feeling happy and excited as I reached for my keys that were in my purse to the moment when I realized they were not where they are supposed to be. A moment that led me to searching, to having to text and tell someone I was not going to make it to our Bible study and to please lead for me, to searching, to turning my house inside out, to searching, to digging every blessed piece of trash out of my dumpster, to searching, and finally to realizing, these keys – were not going to be found. I called to ask about the cost of replacement. Umm…$$$. My heart sank and so did my attitude. I found plenty of reasons to be further annoyed throughout the day – A messier house, a mountain of dirty laundry, a spider that couldn’t be killed “because God’s creatures need to be taken care of and live naturally without harm in their environment”, and also when the same said creature-loving child, also, insisted on using the /th/ sound completely inappropriately…with /f/. I mean, this.day. But, somewhere between a disagreement involving the word “some/f/ing” and feeding my animals, as I was inwardly lamenting my key/ key fob situation in light of the sudden expense that would be associated with it…I realized something. My husband and I, just two days ago, decided to follow the Spirit’s leading and we upped our monthly tithe amount. Would anyone happened to be surprised that the cost replacement for my key/key fob is an amount within a ten dollar range of the amount we just decided to raise in our giving? 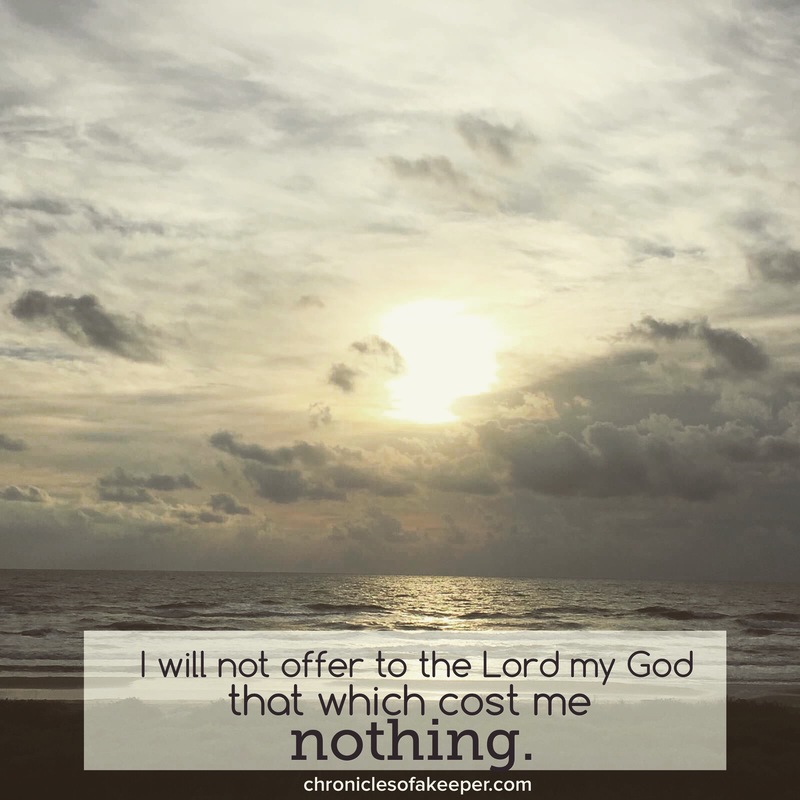 I was reminded of the verse I heard last week in church, 2 Samuel 24:24 – “I will not offer burnt offerings to the Lord my God that cost me nothing.” If you follow me on Instagram or on my Facebook page, you saw that I posted the following picture and referenced that verse. I was immediately humbled by this thought. The Spirit gently, yet pointedly, gave me a heart check. I was reminded of a conversation I recently had with the Lord about not just doing for the Kingdom that which is easy, but doing that which causes me to: strain, struggle, and sacrifice – so I can know Him more. I want my relationship with Him to be one where my love, trust, reliance, and desire is buried in Him. To say that I was embarrassed and saddened that the first moment I am presented to live the words found in 2 Samuel, I complain and gripe. Failure. Praise God for a “grace that is greater than all my sins” and all my failures. Even in my failure, He chose to draw me in and bring me closer to what I daily pray for – a heart and life that can only be found in Him.